ICELAND experienced one of the most powerful lava explosions in the past 50 years from Grímsvötn volcano recently. 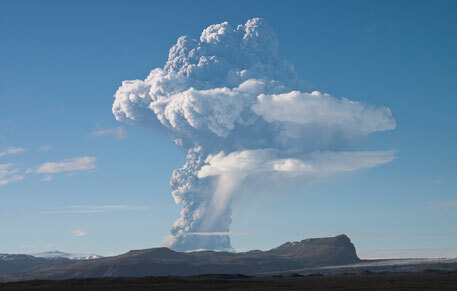 The ash cloud spread across Iceland, UK and North Atlantic Ocean, and disrupted life. Alarmed, researchers set to investigate what would happen if one of the largest volcanic eruptions in history were to happen today? The acidic aerosols and volcanic gases released from such eruptions pose severe health hazards. They also cause air pollution. A team of scientists from University of Leeds in the UK studied Laki volcano that erupted from June 1783 till February 1784 in the south-central Iceland. Although it did not produce large amounts of volcanic ash, it did spew an estimated 122 million metric tonnes of sulfur dioxide gas into the sky—a volume higher than industrial activity today produces in a year. Historical records suggest that in the two years after the Laki eruption, approximately 10,000 Icelanders died—about one-fifth of the population—along with nearly three-quarters of the island’s livestock. The Netherlands, Sweden and Italy reported decreased visibility, respiratory difficulties and increased mortality. Around 23,000 people died from exposure to the volcanic aerosols in Britain alone. To assess how such an eruption might affect the densely populated Europe of today, the team used weather models to estimate where sulfur dioxide emissions from an eight-month-long eruption would end up. They also estimated the resulting increases in the concentrations of airborne particles smaller than 2.5 micrometres, the size of aerosols that are easily drawn into human lungs and cause respiratory distress. They used medical data to estimate how many people these aerosols would kill. In the first three months of the eruptions, the researchers say, average aerosol concentration over Europe would increase by 120 per cent. The air would also become thickest with dangerous particles in areas downwind of the eruption, such as Iceland and northwestern Europe, where aerosol concentrations would more than triple. In the year after the eruption, the increased air pollution will move from Iceland to Europe and cause heart and lung disease on a massive scale, killing an estimated 142,000 people. The study was published in PNAS on September 2011. “This is the first large-scale simulation which analyses what happens to the volcanic emissions and impacts on health,” says David Pyle, a volcanologist at University of Oxford. “This can be applied in other countries,” he adds.